What Caused the Dec. 2015 Tornadoes? Monday marked the one year anniversary of the deadly tornado outbreak that killed 13 people. A total of 12 tornadoes hit eight counties in North Texas. Three of the tornadoes were rated EF2 or higher, with most of the fatalities occurring at the Interstate-30 interchange with President George Bush Turnpike. There was a very strong cold front draped across Texas and Oklahoma with an area of low pressure near the Red River. Ahead of the front, dew points were in the 70s. It was cloudy, but instability and wind shear values were favorable for severe storms. During the morning hours the National Weather Service, The Storm Prediction Center and meteorologists at NBC 5 issued warnings about the potential for severe weather that day. At noon, the National Weather Service launched a special weather balloon to gather additional data (this is typically done only twice a day- morning and night). The new information was not good news. Instability levels were three times higher than normal December standards, there was no cap (a cap prevents storms from forming) and low level winds and shear were increasing (wind shear is wind in different directions with height. Winds turn, like a tornado). With this new data, a Tornado watch was issued. Below is the map of watches and warnings. 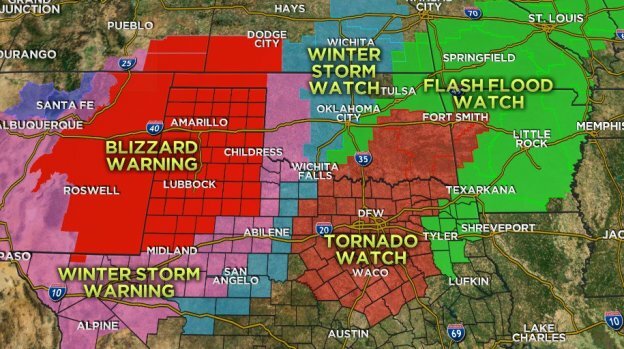 While north Texas was under a Tornado Watch, areas to the west had Blizzard Warnings. The first Tornado Warning was issued at 1:43 p.m. The outbreak lasted all evening with the last warning issued at 11:30 p.m.